After celebrating yet another birthday -- this time for our youngest, who turned three earlier this week -- I realized something. On my children's birthdays, in some small and quiet way, I'm not only celebrating them, but also myself. Pride wells up within me, the same sense of accomplishment that used to come over me when the girls, as babies, were weighed in at the pediatrician's office and had gained a few ounces or pound since the last appointment. I'd nod to the nurse calmly, but inside I was vigoriously patting myself on the back and planting a kiss on my own forehead. Would you look at that? That kid you've got there is growing! You're doing it! And every birthday, I think the very same thing. Do you see that kid there? The one with cupcake icing on her face? She's growing! Each time the candle smoke disappears into the air and the Happy Birthday chorous finishes, that pride sinks in subtly. These kids of mine, they're growing. This envigorating and exhasting, glorious and mundane, personal and universal, joyful and terrifying thing called motherhood -- would you look at that? -- I'm doing it. Looking for a good read for summer? 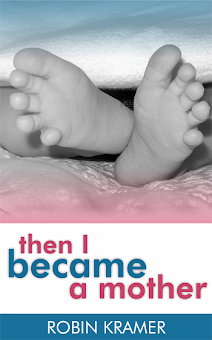 Then I Became a Mother is on sale! We think so much alike. I go through the same thought process, sometimes for the little things, like when she's all done with her bath at the end of the good day. My baby just graduated preschool today. So bittersweet...... but she's growing! Oh, a preschool graduation is precious and bittersweet, indeed! Congratulations! I remember occasionally seeing my Dad look at me with this silly proud look - the hint of a tear welling up in the corner of his eye. I always thought he was just super-emotional (maybe he was), but now I catch myself doing the same thing when I look at my girls!